Pope Francis has appeared to back Native Americans fighting the proposed Dakota Access Pipeline. The Pope said indigenous cultures had a right to defend "their ancestral relationship to the earth". He did not specifically name the Standing Rock Sioux and Cheyenne River Sioux tribes, who are opposing the pipeline in North Dakota. It came as an executive at the company building the Dakota Access Pipeline compared opponents to terrorists. Joey Mahmoud, executive vice president of Texas-based Energy Transfer Partners, has told Congress the protest movement "induced individuals to break into and shut down pump stations on four operational pipelines". He continued: "Had these actions been undertaken by foreign nationals, they could only be described as acts of terrorism." Thousands of people have been descending on the area, setting up camps along the final stretch of the planned 1,172 mile (1,886km) pipeline. Opponents argue the project would contaminate drinking water and damage sacred burial sites. Barack Obama's administration denied the company a land permit to build the pipeline. But Donald Trump is pushing to go ahead with the $3.8bn (£3bn) oil pipeline, with a judge rejecting the two tribes' plea for a temporary stay after the US Army gave it permission to proceed. Part of the route lies on US Army controlled territory. However, it seems Mr Trump will find himself at odds with the Pope, who spoke at the Indigenous Peoples Forum in Rome on Wednesday. 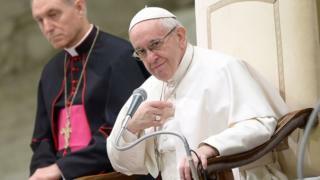 Pope Francis told those attending that all development had to be reconciled with "the protection of the particular characteristics of indigenous peoples and their territories". "In this regard, the right to prior and informed consent should always prevail," he said. "Only then is it possible to guarantee peaceful co-operation between governing authorities and indigenous peoples, overcoming confrontation and conflict."